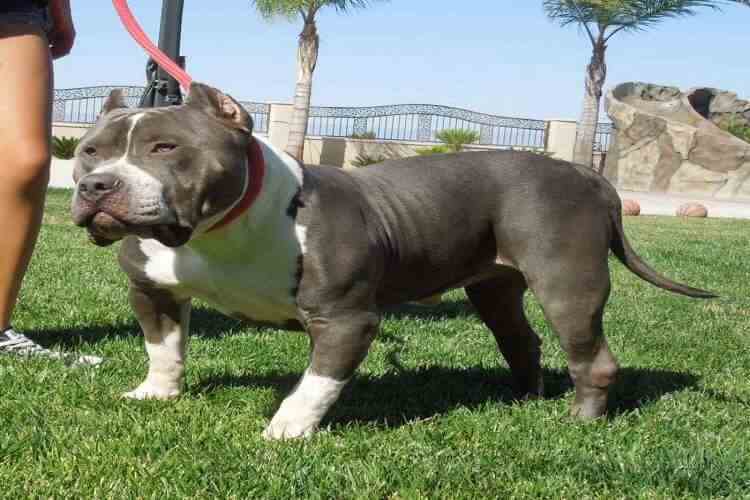 The American Bully has a short, close, stiff to the touch and glossy coat. All colors and patterns are acceptable. The head of the American Bully is a medium length, deep through, broad skull, very pronounced cheek muscles, distinct stop, and high set ears. The ears can be cropped or uncropped. Eyes: all colors except albinism; Round to oval, low down in skull and set far apart. Muzzle: medium length, rounded on upper side or slightly squared to fall away abruptly below eyes. Jaws well defined. Under jaw to be strong and display biting power. Lips close and even, some looseness accepted, but not preferred. Upper teeth to meet tightly outside lower teeth in front or scissor bite accepted. Nose: all colors acceptable. The neck is heavy, slightly arched, tapering from shoulders to back of skull. No looseness of skin. Medium length. Shoulders are strong and muscular with blades wide and sloping. The back is fairly short. Slight sloping from withers to rump or straight accepted with gentle short slope at rump to base of tail. Slightly higher rears accepted, but not encouraged. The body has well-sprung ribs, deep in rear. All ribs close together. Forelegs set rather wide apart to permit chest development. Chest deep and broad. The tail is short in comparison to size, low set, tapering to a fine point; not curled. Not docked. Front legs should be straight. A slight turning outwards of the feet is accepted but not desired, large or round bones, pastern upright. No resemblance of bend in front. Hindquarters: well-muscled, let down at hocks, turning neither in nor out. Feet: of moderate size, well-arched and compact. Gait: should be springy with drive off the rear.Note: When someone refers to a 'blue-nose', or a 'red-nose' pit bull they are referring to the color of the dog.